Have your ever found yourself tasked with sourcing food for employees and clients with dietary requirements? Then you’ll know what a leap of faith it is to find gluten-free catering that’s every bit as delicious and creative as regular corporate catering. As increasing numbers of people are diagnosed with gluten sensitivities, it’s more important than ever to find great food that thrills the taste buds while still sticking to a gluten-free diet. Whether it’s a corporate lunch that’s heavy on fuel but light on carbs, or a swanky evening dinner to delight your VIPs, our guide to gluten-free corporate catering will make dietary dilemmas a thing of the past (and guarantee you plenty of gluten-free brownie points). Those people who need to give gluten a wide berth have typically been diagnosed with celiac disease or suffer from gluten sensitivity. Both conditions can present with symptoms that include severe abdominal pain, stomach upset, diarrhea, bloating, fatigue and headaches, but one is much more severe than the other. Celiac disease: People with this immune disease react to the protein found in gluten, resulting in lasting damage to the small intestine. Subsequently, the body finds it harder to absorb essential nutrients, which leads to malnutrition and weight loss. This is a very serious condition that requires strict removal of gluten from the diet, sometimes even the environment. Non-celiac gluten sensitivity: An estimated 18 million Americans suffer from gluten sensitivity, which presents itself in similar ways to celiacs disease but without incurring intestinal damage. While not as acute as celiac disease, symptoms can be very distressing. You’ll probably know that a few of the common culprits include breads, bread crumbs, baked goods, beer, biscuits, cereals and flour tortillas. However, gluten is also found in brown rice syrup, crepes, croutons, food coloring, oats, French toast, herbal teas, bulgur, couscous, rye, malt vinegar, spelt, pancakes, waffles, wine, and many more. 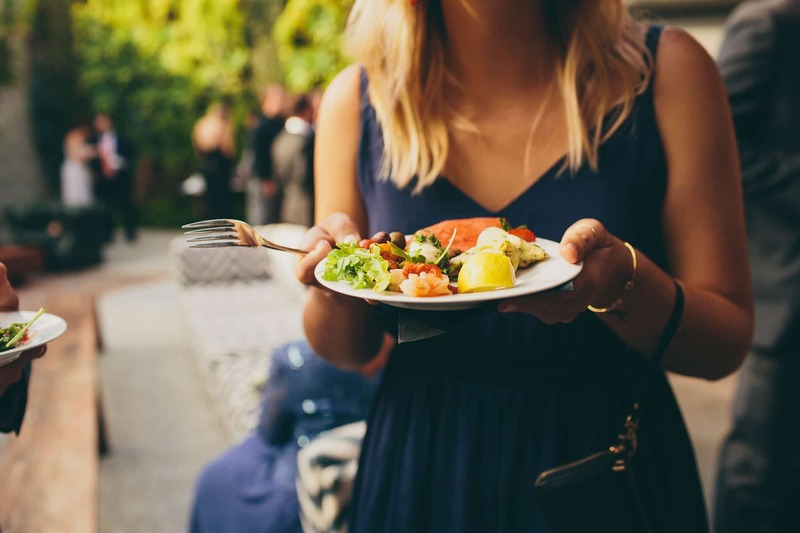 With such an extensive list, when you’re catering for gluten intolerances you need to know you’ve hired a gluten-free caterer you can trust to get your corporate lunch right, both in terms of ingredients, taste and seamless service. Find out how corporate lunch increases employee productivity. Once a tricky dietary restriction to navigate, gluten-free catering services in Southern California has gone mainstream over the last few years. Now quality bakeries, restaurants, and caterers abound with gluten-free options or entirely gluten-free menus. It’s as easy as Googling ‘gluten-free caterers near me’ and away you go. However, gluten-free options have had a bad rep for being bland in the past so it’s a good idea to do your homework before you commit. It’s common sense to ask a lot of probing questions when you’re interviewing any caterer. You need to find out what’s included in the price, whether they’re familiar with your venue, where they source their ingredients, etc. However, given the severity of some food sensitivities it’s wise to be armed with a few specific queries when it comes to gluten-free corporate catering. Catering for someone with celiacs disease? Then the first thing you need to know is whether your food is being prepared in a gluten-free facility. Even flour in the air can put celiacs at risk. Where you’re catering solely for gluten sensitivities, you can relax as caterers have more latitude in terms of the production environment. Once you’ve reviewed their range of gluten-free menu options ask for a tasting. Get a reference from a previous customer who has hired that company to cater for people who’re eating gluten-free. These days, catering for gluten-free diets at work should be a piece of cake. 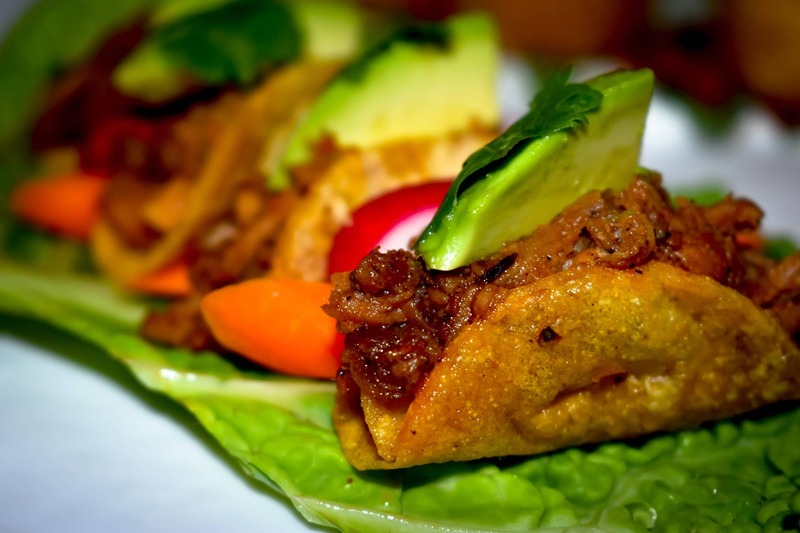 You just need to find a knowledgeable, creative local caterer with the experience to swap out any troublesome ingredients without scrimping on taste. At Eco Caters, we believe the building blocks for flavor in any dish, traditional or gluten-free, are organic, locally-sourced ingredients. Ingredients with provenance, that are good for our bodies and environment. Naturally, that’s also our starting point for our a gluten-free menu (and luckily, fresh fruit and vegetables are naturally free of gluten). Whether it’s for a corporate buffet lunch or plated dinner event, we simply switch traditional pasta for rice pasta, corn instead of flour tortillas, quinoa instead farro or couscous, bread for gluten-free bread, and create protein-driven meals like brown rice bowls for every meal. 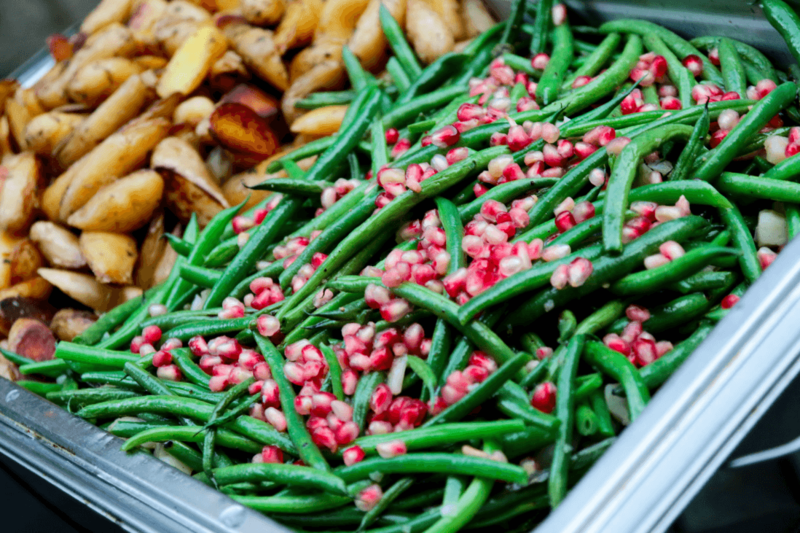 Like any good caterer worth his or her salt, we make it easy for you to cater your corporate lunch or event with confidence, whatever dietary restrictions you need to accommodate. Together, we create a catering menu that ticks all of your boxes, one that will delight and care for your guests. That means delicious, nutritious, delicious food for all of your guests, including those eating gluten-free. Best of all, good gluten-free food needn’t cost the earth. It’s true that we work with the finest local ingredients, the reason being that they burst with bold natural flavors that simply put their commercially grown counterparts in the shade. It means we can use fewer ingredients that punch above their weight in terms of taste, all with minimal salt and interference. So every one of your hard earned dollars is well spent. Also, as part of our commitment to sustainable catering, we pay close attention to portioning, which guarantees that everyone enjoys a hearty meal but without the waste, thus wringing out every last drop of value from your hard earned dollar. 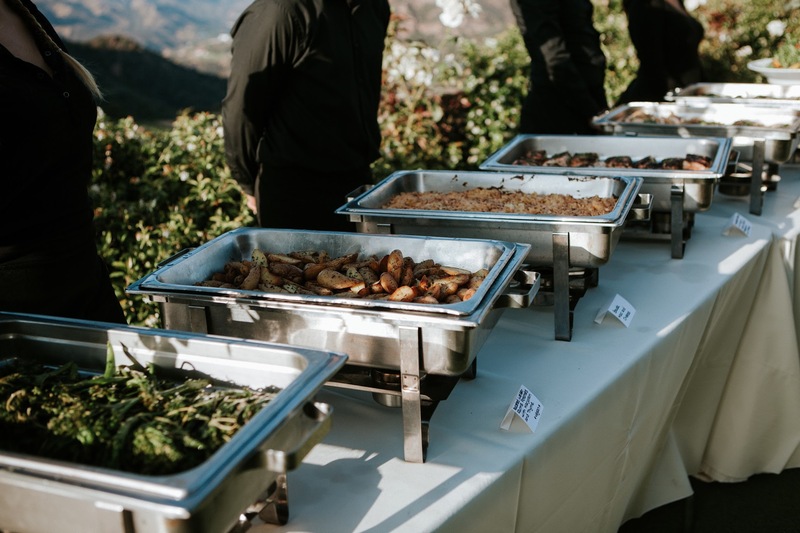 Have you asked yourself, “Where can I find gluten-free catering near me?” If you have to plan corporate lunches or special events and need help with gluten-free catering services, simply get in touch and we’ll be happy to guide you.